When I was a little girl one of the rituals when visiting my Grandma in Belleville, Ont., consisted of walking down her street, crossing the foot bridge over the Moira River and arriving in downtown - Front Street. We would always stop in at the Shoppers Drug Mart and get a treat. At first the treat was candy, and then it was Lip Smackers, and eventually as a young teen, it was BOP magazine. As I got older, most of shops were replaced by parking lots...and at some point that Shoppers moved to different location, building a bigger, large format store. As a Canadian, Shoppers has always been a part of my life. When I was little getting treats with my Grandma, in my late teen years when I was buying my first make-up and dying my hair every (natural) colour of the rainbow. 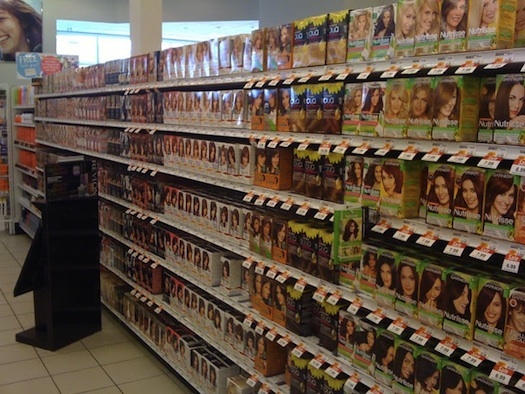 The Hair Dye Aisle...my favourite place to be as a teen. And then, in 2000, Shoppers introduced Optimum Points. At this point my friends and I all had part-time jobs, and my best friend was working at Shoppers as a cashier and pressured me to sign up. I'm so glad I did. I've been collecting points on all my purchases by using my card ever since then. I usually wait until I get to the $85 range before using my points toward a bigger purchase, such as perfume, more expensive make-up or a hair dryer. One of my guy friends even saved up enough points to buy a Nintendo Wii! But back to the evolution of my life and Shoppers - when I started working downtown I used to visit a variety of locations during my lunch break. Whether I was working near Union Station or near the Eaton Centre, there was always a Shoppers for me to go in and buy a magazine, the latest nail polish colour or some deodorant if I had run out. 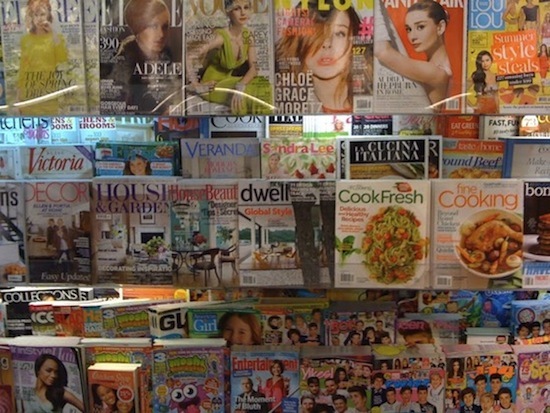 I always have to visit the magazine section on any trip to Shoppers...look at the selection! When I first moved out of my Mom's house, I used Shoppers to buy even more of things. Snacks, cleaning products, toilet paper, Kleenex, toothpaste, prescriptions...the list goes on and on. My roommate and I always remarked that we hoped they never closed our Shoppers for renovations because we would be at a total loss without it. When I started dating Chris, we sometimes went to the Shoppers near his apartment to buy groceries. And now as parents, we shop at Shoppers for baby products in addition to everything else we used to buy. It's really amazing what Shoppers has become, considering it started out as "just" a drug store. Now, as an RBC customer, I can take cash out of the RBC bank machine. I can mail a package or pick up postage stamps in the Post Office. I can print out photos or pick up the latest Sesame Street video game. I can pick up high end make-up or fragrances without stepping foot in to a department store. I can buy the latest books for 25 per cent off. I can even buy most of my groceries (including fruit and veggies) if I choose to! I recently took a relaxing solo trip to a Shoppers near my home as part of a Collective Bias campaign, you can view photos from that excursion here. The $25 haul from my solo trip (and my Optimum Card). With stores within a short distance from most peoples homes, and some locations open until midnight or 24 hours, Shoppers Drug Mart is a convenience to every one, every age or stage of life. I know I will be shopping there for many years to come. 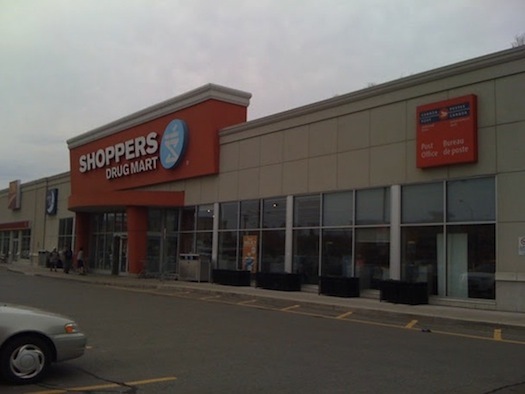 What do you like best about Shoppers Drug Mart? I am a member of the Collective Bias® Social Fabric® Community. This shop has been compensated as part of a social shopper insights study for Collective Bias® #cbias #SocialFabric As always, all opinions are my own. 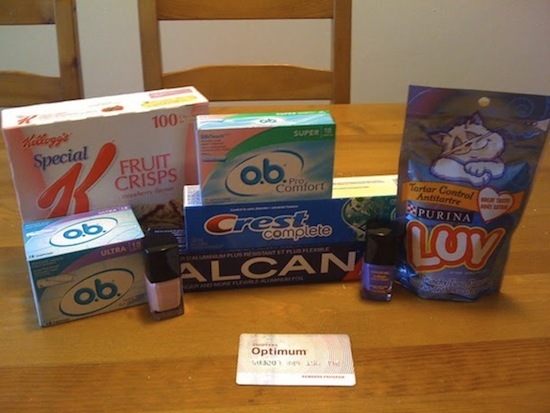 Love Shoppers Drug Mart - love Optimum Points but most of all love that I can get anything I need there. From medicine to milk there really is everything. Shoppers is absolutely my store of choice for our family's personal and medical needs! I love SDM for the same reasons Kerrie mentioned. It has everything and you don't have to run around the city from store to store. Well really who has time to when you have young kids in your car. I love the Optimum Points program too. There are many threads on how to get the most on the bonus reward redemption days. Truly fascinating to read and see how much people get after collecting points for an entire year! I always end up buying things I didn't plan to when I go to Shoppers. They just have such a wide variety. 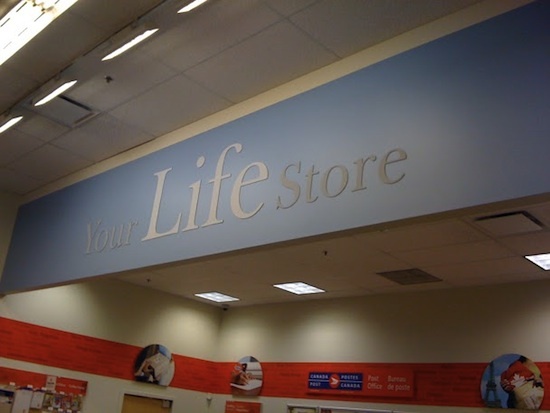 It is totally a place I love to browse and wander the aisles. Also, ours has the post office which I tend to visit regularly. I love the one stop shopping I can do there and I just love getting free stuff with my points!